With the lowest mean elevation in the U.S. at just 60 feet, some coastal communities in Delaware are already experiencing the impacts of sea level rise. Sea level rise is one of the primary effects of global climate change and one that is particularly significant for the state of Delaware. The state’s low average elevation and dependence upon coastal resources for jobs, tourism, and recreation make it particularly vulnerable to the impacts of sea level rise. These impacts include permanent flooding (or inundation) of wetlands and dry land, saltwater intrusion into fresh water supplies and rising water tables. Rising sea levels will also increase the likelihood of flooding and damage during coastal storm events. The impacts of sea level rise will be felt statewide, as no part of the state is more than ten miles from tidal water. 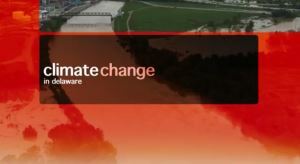 , bringing higher temperatures, rising sea levels and increasing rainfall. Scientific evidence shows that average temperatures in Delaware have increased over the last century, and are expected to continue to rise. Meanwhile, sea levels rose an average of 13 inches over the past 100 years, threatening Delaware as SLR accelerates as expected over this century. And many communities statewide face increasing risks of flooding. 79 percent are convinced climate change is happening now. 76 percent think immediate action should be taken to reduce the impact of climate change. 65 percent believe they can personally take action to reduce climate change. In September 2014 a document was released called Preparing for Tomorrow’s High Tide: 2014 Sea Level Rise Workshop Proceedings and Interim Implementation Plan. This document contains the results of the workshop held in March 2014 which brought together stakeholders for the purpose of developing specific implementation actions for the sea level rise adaptation recommendations published by the Sea Level Rise Advisory Committee in September 2013. The information contained in the document can be used as an Interim Implementation Plan to guide efforts by stakeholders for sea level rise adaptation. 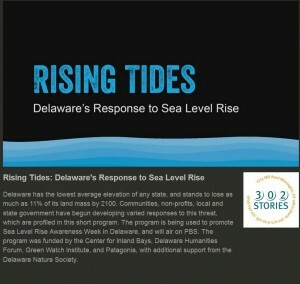 A website with a calendar of events and links to all of the organizations sponsoring the annual Delaware Sea Level Rise Awareness Week can be found at: SOSDelaware.org. A variety of resources can be downloaded from the website including a fact sheet brochure that features a variety of actions individuals can take to minimize the consequences of sea level rise.